AWARD WINNING: The 2017 SOC Lifetime Technical Achievement Award Winning Patented SILENT CAT™ CAMERA SLIDERS are the quietest, smoothest and most versatile camera sliders. With a payload capacity of 160 lbs., they also provide the same smooth and quiet ride for smaller camera platforms that weigh as little as 12 lbs. QUIET: Our custom designed wheel bearing and track system provides the quietest ride for sound recording in any circumstance. We design and manufacture every component of the wheel assemblies and we designed and own the die of the track extrusion. RESISTANCE: THE SILENT CAT™ CAMERA SLIDER is the only camera slider with variable resistance to allow the operator to set resistance on the slider as he would set the resistance of the tilt and pan on a fluid camera head. OVER/UNDER MOUNT: Featuring a standard Motion Picture Industry Mitchell Mount, the SILENT CAT OVER/UNDER MITCHELL MOUNT TROLLEY is the most advanced and unique mounting system of this genre. It has an exclusive patented design that enables the user to switch from a top mounted camera position to an under slung camera position requiring no tools. STRUCTURE: The Patented Lightweight Perimeter Tubular Structure Design provides excellent structural properties. This design has a unique mounting pattern to allow our proprietary 360 Degree Pan Mechanism to be mounted anywhere on the perimeter structure. 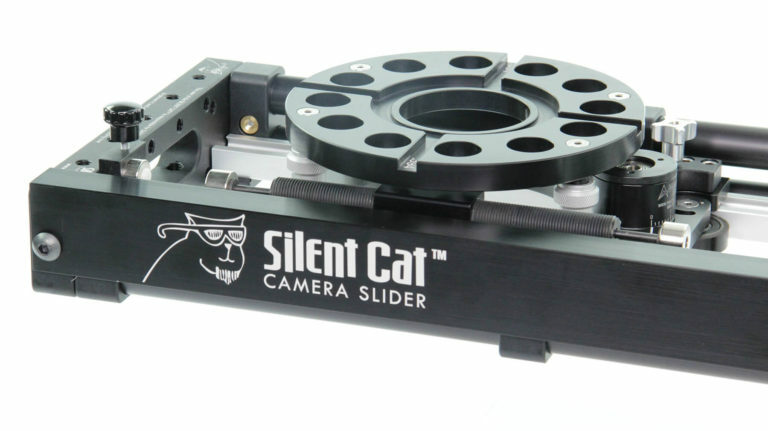 The SILENT CAT™ CAMERA SLIDER can be canter levered, center mounted, and mounted virtually any position over the length of the SILENT CAT™. By removing the 360 Degree Pan mechanism, the Silent Cat Slider can sit flat on the floor or any flat surface. SOFT STOP: Our magnetic assisted dampeners produce a soft stop when the trolley approaches either end of the slider. The soft stop dampeners can be used in conjunction with the start/stop blocks integral to the slider to allow repeatable moves with the trolley. BRAKES: The Silent Cat Camera Sliders have easily accessible trolley and pan brakes that are solid. RIGGING: With 20-3/8”x16 standard threaded taps on each end of the slider, the Silent Cat Slider is the easiest slider to rig when a unique camera position is needed. 100MM/150MM MOUNTS: That Cat-Silent Cat manufactures Mitchell to 100 MM Ball Adaptors as well as a 150 MM Ball Mount to allow the operator to use the full spectrum of camera heads available to them. CAT PAWS: Similar to a hood mount, this optional accessory provides an adjustable four leg base to use the slider from ground level to 24”. RIBS: The Rigging Intermediate BlockS provide additional rigging points anywhere on the slider when needed. In addition to the End Block Rigging points, the Silent Cat Sliders have unlimited rigging possibilities. MADE IN THE USA: That Cat-Silent Cat designs and manufactures nearly every part and component of their award- winning sliders. We design and manufacture our wheel bearing assemblies and we own the die to our exclusive track design. This ensures our ability to stand by the quality and customer support of our products.